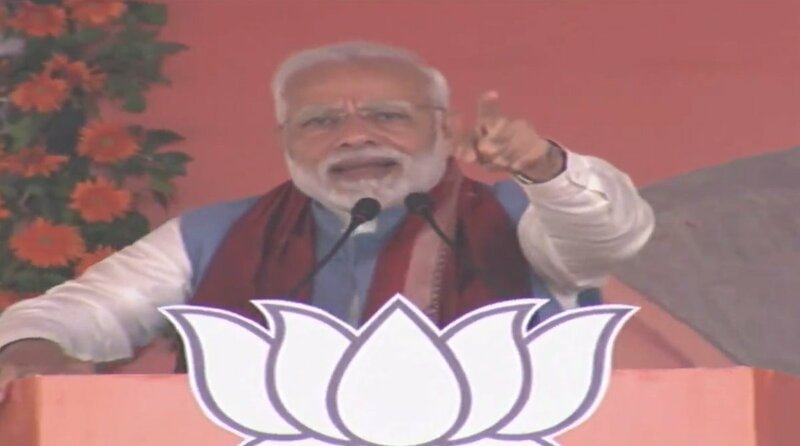 Balangir: The Prime Minister Narendra Modi today criticized the Odisha government for failing to spend the District Mineral Fund (DMF) for the welfare of tribals. The PM also highlighted about the development projects launched by him in Odisha during his recent visits to the state. “In a month, more than Rs 20,000 crore of development projects have been either inaugurated or initiated in Odisha. Projects worth more than Rs 1,500 crore in sectors like education, connectivity, culture and tourism, that have been launched today, will not only spur the growth of Odisha but also of eastern India,” he said. “My pro-poor decisions have enraged people who used to loot public money. They have now been deprived of the opportunities to plunder public money,” he added. Modi today dedicated Multi-Modal Logistics Park (MMLP) Jharsugudaand other developmental projects to the Nation. The Prime Minister has inaugurated a new railway line from Balangir-Bichupali. He has also laid foundation stone for permanent building at KendriyaVidhyalaya, Sonepur. Electrification of 813 km of Jharsuguda-Vizinagaram and Sambalpur-Angul lines at a cost of Rs. 1085 crores. It will ensure seamless rail connectivity on the line. Doubling of 13.5 km Barpali-Dungaripali and Balangir-Deogaon road line. The doubling of line will give a boost to industrial capacity in Odisha. Dedicated of Bridge no. 588 between Theruvali-Singapur road station. It will result in rebuilding of the linkage over Nagaveli river which was washed away during floods in July 2017.